DAY 5 ICELAND: SHEEP ON THE ROAD! Day 5 in Iceland, bad weather with super strong wind. We drove to Egilsstadir, we didn't plan much for that day as we were following the plan from Guide to Iceland-12 day self drive tour. During the driving, we saw a lot of amazing landscapes and a lot of waterfalls. We also went to the town called Seydisfjordur, situated just next to Egilsstadir, we had lunch over there, did some sightseeing around the beautiful light blue church and a little bit of shopping (A light pink sheep hair cushion). When we drove back, we took some photos with some waterfalls. And we did shop in Egilsstadir a bit for the dinner and I got a mint green cardigan. After the poisonous mushrooms night, we were totally fine, no vomiting, no stomach pain or dizziness. So we had a simple breakfast to start our day! We stopped for looking at the waves and feel the super strong wind! Can you imagine how strong the wind is? And we saw this, just wondering are they a real dinosaurs bones? Probably not, because they should be really rare and valuable to just let them out for decoration. Selfie with the long river just next to the waterfall. We saw so many sheep while on the road, you need to pay attention when you drive to avoid hitting them accidentally . They usually are in groups of 3 to 5. This group had 2 brown sheep! Except waterfalls and sheep, we also saw 2 or 3 times rainbows! After a long drive, the car was so dirty and we had to clean it! We went to the supermarket in Egilsstadir, and I saw so many different kinds and colors wood lines! I got some to make a scarf during the trip in the car! But I still didn't finish because I stopped when we went back to Switzerland. I will start again as today is the first snow of the year here and the weather is getting colder and colder! We were going to Seydisfjordur, it is just next to Egilsstadir after we checked-in. And we stopped just for some photos! As you can see from the photo, the town we were going to is the one you can distinguish next to the sea! A big tourist boat. What a surprise to see one of those in such a little town! Lunch time in this store called Dalbotni. A hotdog, chicken cheese mushroom burger with french fries and a coke. After lunch, we went to see this light blue church in Seydisfjordur. Along the road in front of the church, there is a shop called GULLABUID which sells some home decorations and souvenirs. It is different from the usual souvenir stores which are selling similar things. I really love the shop style and I wish I will have my own shop one day! I really like these vases and the flowers! But I did't buy it because it may break during the travel and it is hard to carry this back to Switzerland as our luggages were already quite full! Instead of this, I got a light pink sheep hair cushion, just for a great memory item! After visiting Seydisfjordur, we drove back to Egilsstadir. We discovered this beautiful waterfall! We drove a bit and saw this waterfall! Should be the name of the waterfall. 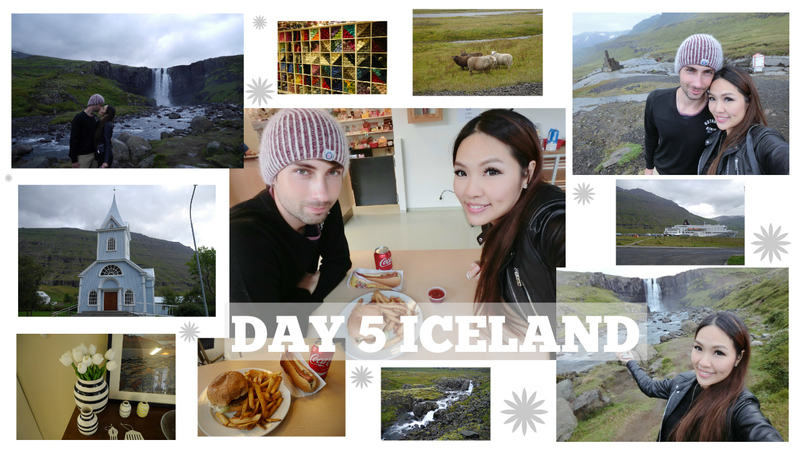 We wanted to take some close photos with the sheep as there are everywhere in Iceland but they were afraid of us! Included living room, kitchen, shower and toilet, parking, noisy heater system and a really bad wifi signal. As we really needed wifi to book the next hotel and plan our schedule. I also needed it to upload photos on my Instagram and videos on my snapchat! It was really bothering me! XD What I really need is the wifi!! !